Today’s Nice Price or Crack Pipe MG is about as elemental a car as you could find, lacking roll-up windows or top that doesn’t require getting out of the car to erect. Perhaps making up for that it has a Wankel engine. Let’s see if its price is pretty elementary too. Apparently the worst thing about riding last Friday’s 1999 Bimota SB8R would be the explaining you would have to do as to why you have a finicky Italian one-off rather than a more traditional Japanese crotch rocket like the TL1000R from which the SB lifted its motor. That particular bike’s price proved to be a secondary annoyance too, and it dropped in a 64% Crack Pipe loss breaking our Nice Price streak at two. Speaking of streaking, why do you suppose nobody does that any more? At one point in time it was an anticipated part of pretty much any major sporting event, awards show, or Baptist church service. Hell, the fad was so popular that Christian Music Hall of Famer Ray Stevens even wrote a semi-humorous song about it—don’t look, Ethel! I’m guessing that most of you are so young that you’ve probably never heard of either streaking or Ray Stevens, and that means you’re probably going to be stymied by today’s 1962 MG Midget too, as it’s about as old-school a small sports car there ever was. The MK I Midget and its sister the MK II Austin Healey Sprite offered some concessions to civility over the Sprite’s MK I Frogeye predecessor—things like an actual boot opening, and a proper bonnet that didn’t require a miner’s lamp to delve under. It was otherwise a pure expression of the sports car ethos at the time. That meant side curtains, and a soft top that stored in the trunk and was worthy of a merit badge for any boy scout who could erect it. It also originally came with a 948-cc edition of the A-series four cylinder engine, arguably one of Great Britain’s greatest achievements when it came to automotive engineering. This one however, eschews the A for a B, a 13B Wankel out of a Mazda to be exact. Now, for editorial honesty I should disclose that I happen to own a 1961 Sprite Mk II with a 948. I also own pretty much every part of a 1973 MG Midget except the shell (which I discarded), including the 1275 A series, rib-case gearbox, and front disc brakes that will all go onto the Sprite at some point in time. This all might sway my opinion towards this rotary-engine’d Mid’g. I’ll do my best to remain unbiased. 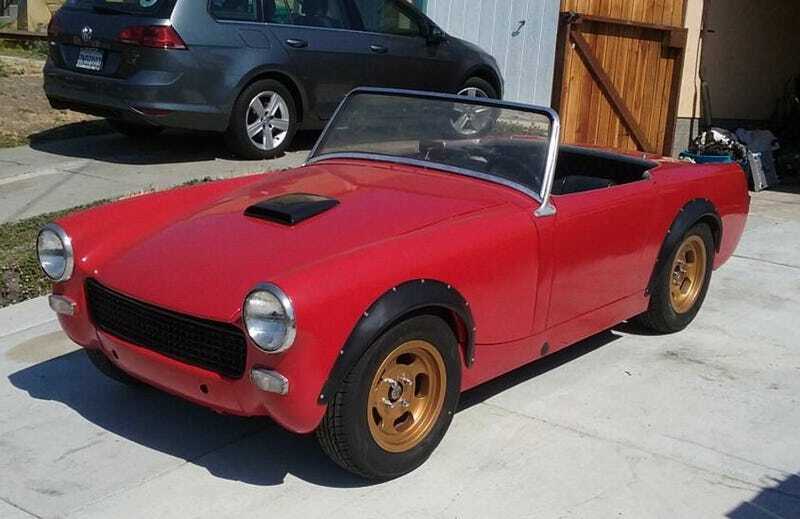 The seller says that this red over black Midget comes with a clean title and is registered for the street. Seeing as it’s pre-1975 it’s not held to any emissions requirements or off-road-only parts requisites here in California where it is presently located. The engine is, as was noted, a Mazda 13B and that rocks a Dellorto side-draught two barrel carb. A custom stainless steel exhaust system helps fill the air with Hmmmm, and a five-speed Mazda manual puts the power down. The ad says that the front brakes have been updated to discs, probably in similar fashion to my plans, and that all of the wiring has been redone. The Smith’s instruments look to have been replaced with something a little less classy and the steering wheel looks like one you might pickup as an impulse purchase at Pep Boys. It’s otherwise all pretty tidy. Don’t expect a heater in this car though, you’ll just have to be warmed by your own sense of self satisfaction for driving something as cool as this car. Don’t expect a top either as it looks like a number of the Liftadot studs are missing. That would result in the loose top flapping in the considerable breeze. There’s no wipers either so consider the car to be a fair weatehr friend at best. The rest of the body looks to be in pretty good shape. The gold slot mags are a nice touch, as are the fender flares. I should point out that while advertised as a Midget, this car presents as a Sprite, having an Austin Healey grille and lacking the MG brightwork on the side and hood. Under that hood the Mazda mill looks to be pretty much at home. The intake apparently demanded a hole be cut in the hood for airflow, and that has been topped with a small scoop. What’s not to like here? Well, there’s that radiator that’s said to be out of an MR2 and which seems to be held in place by Zip Ties. That’s the kind of work you see showing up on “There, I Fixed It” not your own driveway. Maybe that’s why the seller says he’s motivated. He also says there’s a bunch of spares that come with the car (all old Midget/Sprite owners have these piles of parts, ask me how I know this) and that the price is $5,900 but that is only a starting point if you’re a serious buyer. We’re pretty serious around here—I mean, weren’t we just talking about streaking?—so let’s help him out by voting on whether that’s a sweet spot to begin with, or is hella’ high for an old Midget, rotary or not. H/T to trurl for the hookup! For $12,000, Could This 1999 Bimota SB8R&apos;s Price Entice You To Bi This Mota?